↑ 1.0 1.1 "Azim Premji". Britannica. Retrieved 26 December 2013. ↑ 2.0 2.1 "The World's Billionaires No. 83 Azim Premji". Forbes. 3 November 2009. Archived from the original on 29 November 2009. Retrieved 7 December 2009. ↑ "What you didn't know about Rishad Premji". Rediff. 7 June 2007. Retrieved 7 December 2009. ↑ "The World's Billionaires". Forbes. 3 March 2009. Archived from the original on 16 March 2009. Retrieved 16 March 2009. ↑ Karmali, Naazneen. 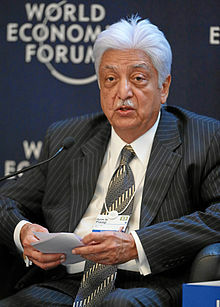 "Azim Premji Donates $2.3 Billion After Signing Giving Pledge". Forbes. Retrieved 2017-04-22. ↑ Western Indian Products Ltd incorporated in 1945. Churumuri.wordpress.com (2009-07-20). Retrieved on 2015-11-21. ↑ "Azim Premji". Worldofceos.com. Retrieved 26 December 2013. ↑ "Billionaire Profile: Azim Premji by Mandovi Menon". MENSXP.COM. Retrieved 1 October 2013. ↑ "Rishad Premji is Wipro's new CSO". The Hindu. 2 September 2010. Archived from the original on 8 September 2010. Retrieved 10 September 2010.